First, I have to apologize to you all for this beautiful photo of Eggs Benedict. I truly love runny poached eggs as part of Eggs Benedict. The yolk getting mixed with the Hollandaise sauce and the salty Canadian bacon, fluffy egg white, crunchy toast...delish! I chose this photo because who wants to see plain old poached eggs on a plain plate? Not exciting, if you asked me. Oozing sauce, the variation of textures, nice! Sorry I didn't show the yolk oozing into the sauce. I was too busy snarfing to take another photo. 1.Combine water and vinegar in a saucepan. Bring up to a simmer. You want it to be gentle, just bubbling a tiny bit. A hard boil will ruin your eggs. 2. Break eggs into separate bowls. 3. Give the water a little stir and carefully slide your first egg into the middle. You want to be as close to the water's surface as possible so the egg doesn't break up as you drop it. Give it just a few seconds to start to set up. Using your slotted spoon, sort of coax it into a little ball so if you have egg white that's trying to spread out, it goes back to a rounded shape. Some people don't stir the hot water and just slide them in along the edge. I've tried this and not liked the results. I think the little swirl helps to keep it round. 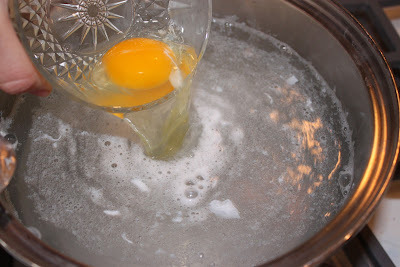 Also note that the more eggs you cook, the frothier your poaching water will become. It's normal. If you have a lot of floating cooked egg white residue, you should skim it off. When the first egg is holding together well, add the second egg. Now don't go and confuse which egg is which. 4. For a really nice runny yolk, cook 2-3 minutes. If you go over 3 minutes, it will get too firm. I aim for about 2 1/2 minutes. Remove egg with a slotted spoon and let as much water run off as possible. 5. I like to serve poached eggs on top of toasted English muffins with Canadian bacon and Hollandaise sauce, as Eggs Benedict. You can top it with minced parsley, chives, or green onions. I tried the Julia Child blender-method Hollandaise sauce. It worked, but I didn't like the flavor. I guess I can attribute the difference, the nuances, to the cooking method and amount of lemon juice. I prefer less lemony-ness. 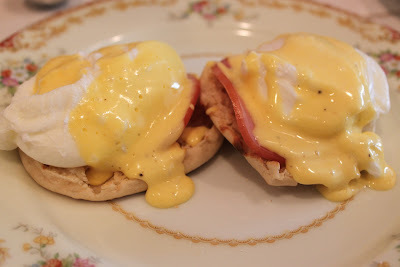 If you're like me, try Gordon Ramsay's Hollandaise. I'm not big on tarragon, it's sort of like licorice. You may to experiment with amounts of tarragon before making a bunch of sauce you don't like.